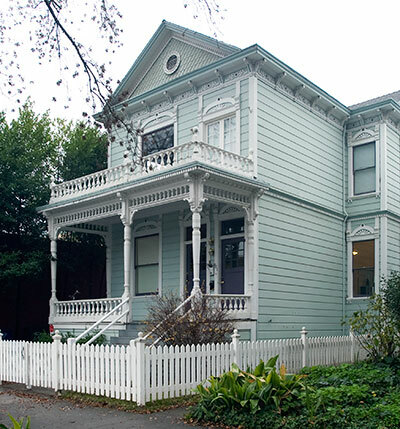 The Mary Haley Galarneaux House is a fine example of the Italianate Victorian style and an excellent representative of Sacramento's late 19th century residential architecture. In 1915, the house was moved from its original location to a compatible neighborhood with other older residential buildings. The property went through several owners after Mary Haley Galarneaux. It is believed that a Japanese family owned the house prior to World War II but lost it when they were sent to the internment camps. After that time, the house was supposedly used as a speakeasy and gambling house. During the 1970s the house was part of the red light district. By 1977 the local architectural survey had listed in poor condition. By 1997 it was totally dilapidated and in serious danger of being condemned. When the house was listed on the National Register in 2001, the neighborhood had been gentrified and the Victorian houses and Arts and Crafts bungalows had been restored.